American cinema is often an endeavor of epic scale. We're defined by the Western and its deep-focus, panoramic landscapes, and we have a proud history of action films and Hollywood's multi-million dollar budgets. But there are other trends in cinema history, arguably deeper-running than the interest in the massive; when you dig through the canon of influential films, you'll find equal parts epic and intimate, grandeur and nuance. This month will be dedicated to the oppositional trend in film, so often found in European and independent cinema, but also alive and well on the side-roads of Hollywood: the trend toward intimacy. Deleuze wrote one of the definitive books on cinema with Cinema 1: The Movement-Image and Cinema 2: The Time-Image. In Cinema 1, he broke the semiology of cinema down into three aspects. One of these is the affection-image, which Deleuze strongly associates with close-ups and shots of the face; he asserts that any shot of a face is essentially an image of its emotions, and that any close-up... even of an inanimate object... gives its subject a face, in a certain way, allowing it to express an affectation isolated from the action of the environment. In these passages, Deleuze was providing an important exploration of the capacity of cinema to act on an intimate level, creating mythic events from the simple acts of looking, reacting, and betraying an emotion. Deleuze briefly discusses a film that's indispensible in a discussion of cinematic intimacy: The Passion of Joan of Arc, the iconic, bold, and powerful film from Carl Theodor Dreyer. Deleuze points out that this is a whole film made up entirely of close-ups; Joan's suffering is truly the whole substance of the film, which only covers her trial and her execution. 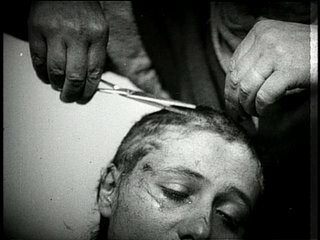 This is a level of intimacy pushed to its furthest limit... Dreyer frames his shots in such a way that there's no visual set or context, and he edits them in a way that doesn't create any relationships between the participants (as pointed out by Matthew Dessem of The Criterion Contraption). Thus, each face, whether it suffers or condemns, is isolated and treated with a searing purity of representation. Dreyer shows us what true film can really do: it can create an almost unbearable level of sympathy, whether for joy or for suffering. He shows us the capacity for film to make us feel strangely uncomfortable, confronted with a raw rush of emotion; the cutting of Joan's hair was harrowing for me when I watched The Passion, so engaged was I with Joan and her trials and humiliations. Cinema's ability to create an enclosed world is obscurely matched by its less-appreciated ability to obliterate that world, and every other world, in order to frame an emotion in its purest form. There's another film whose intimacy made me uncomfortable at times, less as a result of shared suffering, and more because it transgressed some rigid boundaries that I didn't expect to see crossed. This is Harold and Maude, a beautiful if unconventional love story made in 1971, and another prime example of intimacy on the movie screen. The Passion is an intimate treatment because of its technical decisions; Harold and Maude is intimate because of its characters, and the audience's exposure to them. Roger Ebert claimed the movie was "a movie of attitudes. Harold is death, Maude life, and they manage to make the two seem so similar that life’s hardly worth the extra bother." This would be true, if it wasn't for the inconvenient ambiguity in the characters that Ebert seems to ignore: Harold's youthful side, expressed in his enthusiasm for his morbid hobby; Maude's interest in balance, rather than life per se, and the undertone of denial beneath her sweeping joyfulness. The film starts with a focus on Harold and his antics, and this sets him up as the character we identify with. We get to know his obsession very well, and as his mother tries to socialize him, we gradually discover that it's actually a self-defense mechanism: death is his way of shielding himself from a deadening world around him. Our understanding of Maude is slightly shallower, as we see her through Harold's eyes, but nonetheless, as avid voyeurs, we are able to start penetrating her personality. She is an old woman who has adopted the attitude of a child, a spirit of irreverence that leads her to gestures in pursuit of simple beauty, even if they involve petty crimes. She is the flower-matron of the 60's, an artistic eccentric... there are only one or two moments when we see beneath this facade and realize she has overcome great hardships. All it takes is a pensive moment and a flash of a tatoo on her arm for us to see the difference between her and Harold: he obsesses about death simply as a cosmetic decoration on his annoying life; she is cavalier about her life and dismissive of death, but only because she knows its face far better than her young paramour. 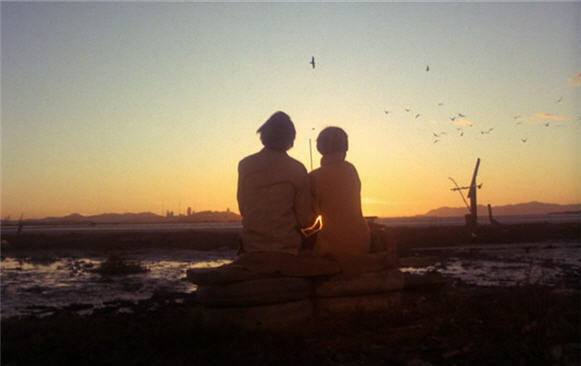 Harold and Maude is an intimate movie because it penetrates deeply into the personalities of its two eccentrics, giving us enough insight into their lives that we could write psychological profiles on them (in fact, I first saw this movie in a psych class!). It's also an intimate movie because it doesn't back away from their physical and emotional proximity, a closeness that many of its original viewers found unsettling. Small subjects, private moments, and uncomfortable closeness: these will be the themes of my run of movies in May. There are some good movies coming out that speak to these motifs. First, at the end of this week, there's Babies, a mainstream documentary whose premise is deceptively experimental, when you get past the cuteness: it's a chronicle of the first year in the lives of four brand new humans, no narrative or dialogue, relying on expressions and juxtapositions to drive an understanding of a sentimental subject. Second, screening in New York from May 12 to May 16, is Beetle Queen Conquers Tokyo, a documentary about the obsession with bugs and etomology in Japan. Finally, slightly less relevant: Micmacs, a new film from chronic eccentric Jean-Pierre Jeunet, who brought us Amelie, City of Lost Children, Delicatessen, and Alien: Resurrection (weird on that last one, huh?). I don't know about Micmacs, but I know Jeunet is a master of uncomfortable closeness and intimate eccentricity. As far as old movies go, I have a few lined up. Tokyo Story, a story of a family's changing relationships in post-war Japan, is one of the absolute essentials of cinema, right up there with Dreyer's Passion. Watership Down is a dark animated film about a society of rabbits, caught up in dramatic struggles within the animal kingdom. Au Hasard Balthazar is a journey through a harsh world through the eyes of a girl and her beloved donkey. Billy the Kid is a documentary about a young boy's coming of age in a small town in Maine; Hard Candy is a psychological thriller about a girl who creates a trap for a child molester. Finally, if I get through all those, I'll see Kikujiro, a film about the bond between a little boy and a crass drifter, by Japanese director Takeshi "Beat" Kitano. I like this theme, but I found it a little difficult to find movies that fit it very well. I know it's a bit cryptic anyway, but if anyone has any other suggestions, please let me know. I'd especially apreciate suggestions of movies that are more high-spirited (there's a lot of sad ones up there), or movies that have a little more action to them while still fitting with the general idea of "Intimate May."